Homeopathy is a system of medicine developed in the eighteenth century by German physician Samuel Hahnemann. Unlike conventional medicine where drugs are given to work against the body and its symptoms, homeopathic remedies work with the body to help stimulate its healing functions. In medicine, there are two basic ways for treating ill health: i) the way of opposites; and ii) the way of similars. Consider a patient with a cough. The way of opposites is to use anti-cough drugs that suppress the cough. The way of similars (homeopathy) is to give a medicine to help the body recover from the cough. A homeopathic substance that will cause a cough in healthy persons can cure a similar cough and restore health in the ill patient. In homeopathy, your uniqueness is very important. Using our cough example, conventional medicine treats all coughs alike. In homeopathy, how you uniquely express the cough is important to your treatment as are the other symptoms associated with your cough. All of the symptoms you experience are important to help us select the correct homeopathic medicine for you. Homeopathic medicines are made from plant, animal or mineral products which are so diluted that there is no chance of toxicity. 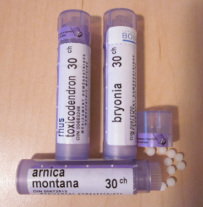 After taking the homeopathic substance, your symptoms may become worse before they improve. The worsening is usually a good sign that the medicine is working and your body is "house cleaning" in order to restore your health. If this occurs, please contact your naturopathic physician. -Avoid coffee, camphor, mint, perfume, strong odors, essential oils or recreational drugs since these substances are known to antidote the effect of many homeopathics. -Store your homeopathic medicine away from light, strong odors and extreme heat or cold. -Take your medicine at least 10 minutes before or after eating or drinking since food and drinks may interfere with its activity. -Do not touch the pellets with your hands. Gently tap two-three pellets into the lid and then toss them into your mouth so they can dissolve under your tongue. If you have a liquid homeopathic, squirt two-three under your tongue. -Take your homeopathic medicine ONLY as prescribed.